Whether on earth or above it, hilarity is outrageously universal in TV's most popular comedy featuring four forward-thinking but socially backward geniuses. Fun discoveries multiply: Leonard learns jealousy is bad for a relationship [with Penny] but science is good for seduction [of Penny]. Howard finds life on the International Space Station is no escape from terrestrial turmoil between his overbearing mom and his new wife Bernadette. Raj meets someone special who may be a good match, if only he can keep her from fleeing mid-date. Even Sheldon learns a few things: a] what not to say when called in to meet the university's employee relations director, b] what happens to childhood TV idols and c] that a Dungeons & Dragons adventure can be the icebreaker his relationship with Amy needs. 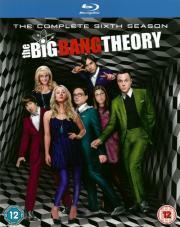 For those who need laughter with scientific regularity, this 2-disc, 24-episode Season Six set of The Big Bang Theory will rock your cosmos.